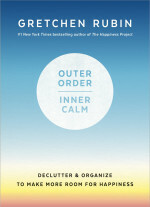 Bringing a sense of fun to the often daunting task of getting “control of our stuff," Gretchen Rubin shows us in Outer Order, Inner Calm that de-cluttering and organization leads to more productive and creative lives. The best-selling author of The Happiness Project and The Four Tendencies shares a key finding related to happiness: "outer order contributes to inner calm." She explains that instead of a "one-size-fits-all solution," individuals must find an approach that works for their personal styles and situations. Providing tools and tips that allow readers to find their own effective strategies, Rubin unpacks insights that can help anyone create "a more serene, orderly environment—one that helps us to create the lives we yearn for." Author Reception - 6 pm - Cost $30, includes signed copy of book. Register to attend the reception by calling 214.523.2240 or by emailingstanfordr@hpumc.org. Presented in partnership with Highland Park United Methodist Church, Friends of the Highland Park Library and Friends of the SMU Libraries. A book signing follows the presentation for those who choose to purchase books.